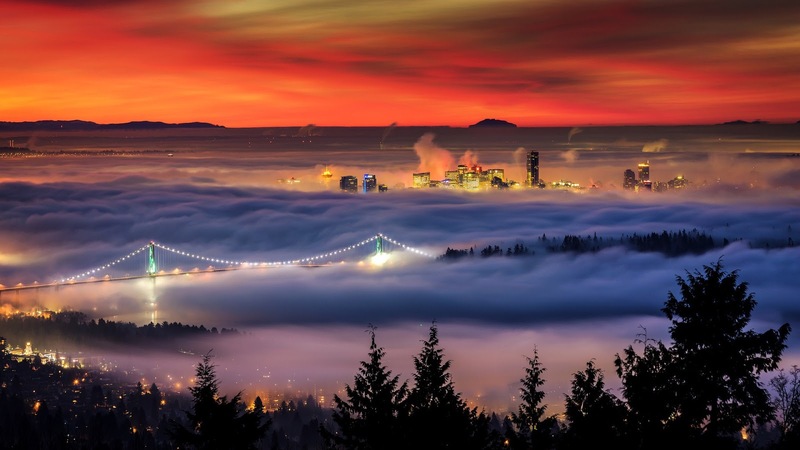 Vancouver has been subject to temperature inversions for some of this month, a relatively uncommon condition where low-laying fog shrouds the city and the Burrard Inlet. If you are really lucky, this low cloud is actually low enough that the top of the Lions Gate Bridge and the higher downtown buildings are above the cloud, with the rest of the city and water hidden. When combined with the pre-dawn light (the inversion almost always dissipates by mid-day), you get the fog lit up by the city lights, and the sky lit up by the impending sunrise. The conditions are rather finicky -- just a little too much fog and you can't see any of the city, which makes for an interesting photo, but not an iconic one. This was my fifth trip to try and get this shot this year -- the first trip was flawed by me only just getting there in time, and by an error in my settings (I'm not a morning person!). The second, third and fourth trips had too much fog, but this morning I once again set off at 6:00am and gave it one last try. The general consensus was that the weather was worsening and that yesterday was the last chance, but I knew I wouldn't be happy unless I gave it a go. On reaching the viewpoint, things did not look good -- as on the previous days I could see from the glow in the fog where the city was, but none of it was visible. But a few minutes later, the level of the fog decreased slightly, and for a few minutes the city and bridge became visible. Unlike previous days, where there were no clouds above me, there was a very thin layer of cloud which was lit up by the sun, below the horizon from my viewpoint, making the sky appear as if it was on fire. Hard as it is to believe, this shot has actually been slightly desaturated. After five dawn starts I'm very glad to have got a photograph that is at least close to what I had been hoping for!